Model 301 Digital Electroscope - FREE SHIPPING! The Model 301 (digital) updates a preferred scouting tool among treasure hunting enthusiasts to provide even better tuning using the digital tuner and the number indicator on the LCD screen in conjunction with the antenna. 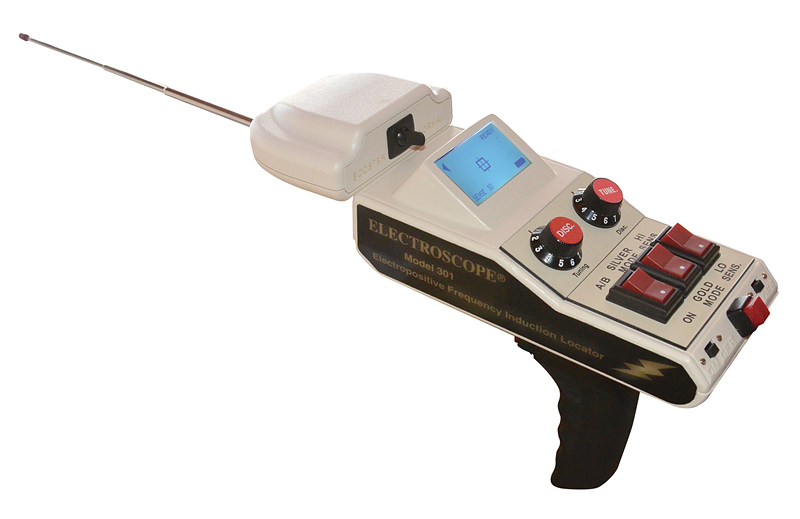 The LCD has multiple features: in the center of the screen the e-gyro stabilizer assists with balancing. When properly balanced, a tone is audible and the word READY is visible. The screen is backlit for lowlight conditions. A battery icon is on the screen to show battery life. When the Model 301 Digital Electroscope is on but not balanced, it will power off to conserve the battery life. Cache hunting or prospecting are the best uses for this unique instrument.